I added profiles for the Gaijin wrestlers, so everyone above has a profile on Joshi City. You can click on their names to go straight to it. As I am watching the Samurai TV version, some matches may be clipped, which I am putting up with in the interest of saving time. Plus its prettier on Samurai TV and I like replays. Per the Stardom Standard, we start with a rookie match. Ruaka and Hanan are still in their first year and are both 13, they have shown early promise but too soon to tell for sure (and they may not keep wrestling anyway as so many younger wrestlers don’t last). Starlight Kid is also under 18, the only adult in the match is Shiki but she is also the least experienced. Low expectations as always, but valuable experience for all involved. 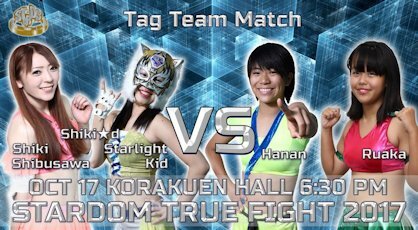 Hanan and Starlight Kid start the match, they do a fast paced exchange but neither gets a clear advantage. Shiki and Ruaka tag in but Ruaka tags right back out for reasons unknown, elbows by Hanan to Shiki but Shiki strikes her back. Ruaka runs in to try to help but Shiki dropkicks them both in the corner before tagging in Starlight Kid. Hanan avoids Starlight Kid’s dropkick and throws her down by the mask, leading to Shiki tagging back in. Shiki elbows Hanan but Hanan kips up, dropkick by Shiki and she puts Hanan in a crab hold. Hanan eventually gets to the ropes for the break, Hanan tags in Ruaka while Starlight Kid is also tagged in. Ruaka and Starlight Kid trade elbows before Ruaka hits a reverse STO, cradle by Ruaka but Starlight Kid reverses it and they trade flash pins. Starlight Kid goes off the ropes but Ruaka catches the crossbody and they trade pins again. Jumping crossbody by Ruaka, but Starlight Kid kicks out at two. Hanan comes in and they hit dual fisherman suplexes onto Starlight Kid, but that gets a two count as well. Ruaka goes off the ropes but Starlight Kid ducks the boot, Shiki comes in and she drops Ruaka with a face crusher. Standing moonsault by Starlight Kid, she picks up Ruaka but Ruaka blocks the Shiranui. Hanan comes in and hits a STO onto Starlight Kid, Shiki comes in and with Hanan they roll out of the ring as they elbow each other. Back in the ring, schoolboy by Starlight Kid to Ruaka, Shiki returns and they both dropkick her. Shiki gets on the second turnbuckle and hits a missile dropkick, Frog Splash by Starlight Kid to Ruaka and she picks up the three count! Starlight Kid and Shiki Shibusawa win! This was a bit awkward. Shiki isn’t good yet, doesn’t mean she can’t be good but she isn’t a natural and it will just take time and practice if she is going to get it (I don’t have high hopes). Ruaka and Starlight Kid got a bit confused too, and when a match is this simple those little mistakes really stick out. A very skippable opener. This is an Elimination Tag Match, a wrestler can be eliminated by going Over The Top, and a team isn’t out of the match until both team members are eliminated. Chardonnay and Scarlett are on their first tour in Stardom, Chardonnay hails from the UK while Scarlett Bordeaux is an American that has been wrestling about six years. 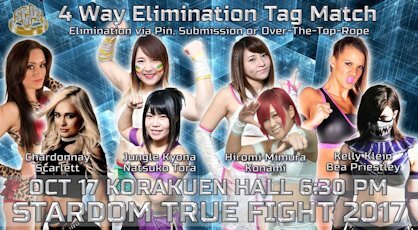 Kyona and Natsuko are both part of “Team Jungle,” a solid young team in Stardom, while Hiromi and Konami are a regular team as well and have referred to themselves as The Chibis. Kelly Klein is representing Ring of Honor as part of their working agreement with Stardom, while Bea Priestley is a UK wrestler that wrestles in WCPW and Lucha Forever. Scarlett not having red hair is throwing me off and likely will the entire match. She and Jungle start the match, running elbow by Scarlett in the corner and with Chardonnay they double team Jungle by pushing their asses into her face. Kelly isn’t amused by this and comes in to clear the ring, she offers Jungle a handshake but elbows her in the chest and throws her from the ring as well. Natsuko comes in but Kelly elbows her also, Natsuko comes in and dropkicks Kelly but Kelly doesn’t go down. Kelly puts Hiromi on her back but Konami saves her, double Irish whip to Kelly but she lariats them both to the mat. They finally get Kelly hurt in the corner, dropkick by Konami but Kelly boots Hiromi when she goes for one as well. Kelly tosses Konami out of the ring before going back to Hiromi, she covers Hiromi but for whatever reason all the other wrestlers break up the pin. Kelly stacks them all in the corner but Hiromi then dropkicks Kelly and Bea into the same cover, Hiromi charges them all but everyone moves when she goes for a dropkick. Hiromi lands on the apron but she moves when everyone tries to knock her to the floor, Chardonnay ends up in the ring with Hiromi and Chardonnay hits a butterfly suplex for a two count. Final Cut by Chardonnay, but Konami breaks up the pin. Chardonnay and Hiromi trade flash pins, until Scarlett boots Hiromi in the head and Chardonnay holds her down for the three count! Hiromi Mimura is eliminated. Jungle comes in the ring and has some success until Scarlett catches her with a Codebreaker, they botch a spinning headscissors before Scarlett hits a side Russian Leg Sweep for a two count. Jungle smacks Scarlett and they trade lariats, Jungle lariats Scarlett onto the apron before knocking her down to the floor. Scarlett is eliminated. Chardonnay comes into the ring but Kelly promptly press slams her to the floor. Chardonnay is eliminated. Konami comes in the ring but Bea and Kelly double team Konami, hitting a spinning slam to the mat. Kelly boots Bea by accident however, schoolboy by Konami but Kelly kicks out at two. Konami gets Kelly’s back and goes for a sleeper, but Kelly throws her off. Kicks by Konami and she delivers the sliding kick, but Bea breaks up the cover. Kelly and Bea both boot Konami, fallaway slam by Kelly and she picks up the three count! Konami is eliminated. Jungle and Natsuko come into the ring and apply small packages to both opponents, but they both get a two count. Double dropkick to Kelly and a double shoulderblock to Bea, and Jungle slams Bea in front of the corner. Natsuko goes up top but Kelly elbows her from the apron and pulls her out with her. Jungle tries to pull Natsuko back into the ring but Bea dumps Jungle over the top rope onto the apron as well, Bea then goes off the ropes and dropkicks Jungle, and Jungle falls to the floor. Jungle Kyona is eliminated. Spear by Natsuko to Bea, and she covers her for two. Natsuko picks up Bea but Kelly returns and they both suplex Natsuko for a two count. Bea picks up Natsuko but Natsuko fights back as she elbows both her opponents, high kick by Bea and she delivers a modified cyclone suplex for the three count! Natsuko is eliminated, and the winners of the match are Kelly Klein and Bea Priestley! I didn’t see any website that had the match structure of this correctly laid out, so I was a bit confused at first. I think some of the wrestlers were confused too but in an eight wrestler match that tends to happen anyway. We need to get Kelly Klein in training with Mari Apache stat, she wrestles too soft for someone that does the “I destroy everyone” gimmick. She has the size and attitude, she just doesn’t bring the pain. Hiromi still did her comedy spots which isn’t a big deal on lower matches, but is a reason why I don’t take her seriously. Too chaotic and random to get excited about, however some wrestlers (mainly Jungle, Konami, and Bea) did look pretty good. This match is part of the three match Queen’s Quest vs. Oedo Tai series. 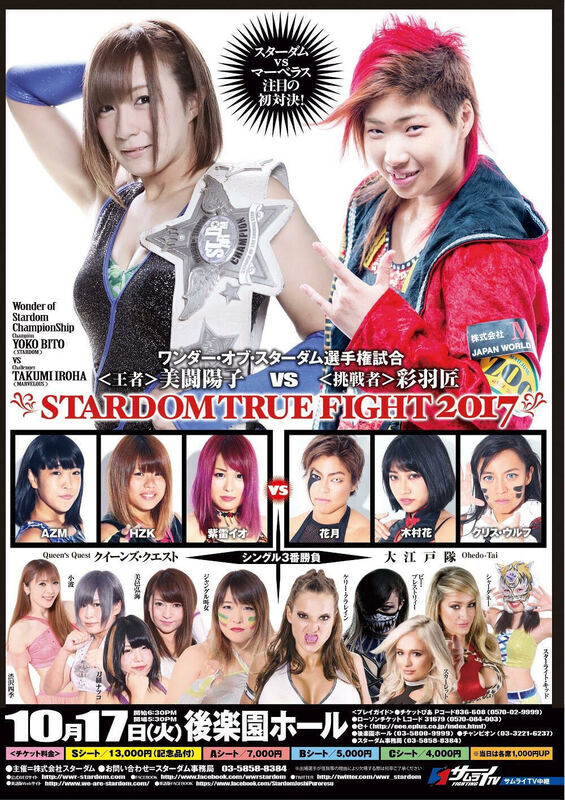 AZM is the youngest wrestler in Queen’s Quest, she is 15 years old and still developing as a wrestler even though she debuted four years ago. 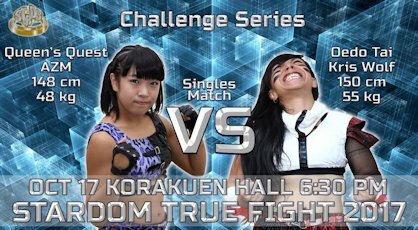 Kris Wolf is a former High Speed Champion and a guilty pleasure of mine as she is always a ball of energy. These two have worked together a lot in the past and have good chemistry, so hopefully they can pull off something fun. They start the match quick, as expected, although not necessarily as smoothly as one may hope. Kris stomps down AZM in the corner but AZM goes off the ropes and delivers a dropkick. AZM charges Kris in the corner, Kris tosses her out to the apron but AZM quickly gets back in the ring and goes for a dropkick. Kris avoids it but AZM returns the favor, and they both end up trading flash pins on the mat with neither having any luck. Takedown by AZM but Kris gets away and they return to their feet again. Kris twists at AZM’s ankle but AZM gets out of it and hits a dropkick, she goes off the ropes but Kagetsu trips her from the floor. All of Oedo Tai get in the ring and stomp on AZM while the referee is distracted by Tam Nakano, but AZM fights them off and applies the hanging armbar. AZM lets go and hits the satellite schoolboy, but it gets a two count. AZM goes for the hurricanrana but Kris blocks it and powerbombs her into the turnbuckles, running knee by Kris and she kicks AZM in the back for two. Kris gets on the second turnbuckle but AZM avoids the diving double kneedrop, AZM goes for a leg sweep but Kris jumps and kicks AZM in the head. Kris picks up AZM and goes for a suplex, but AZM reverses it into a roll-up for two. La Magistral by AZM, but Kris gets a foot on the ropes. AZM goes for a backslide but Kris reverses it for two, kick to the head by Kris but AZM reverses her cover attempt. AZM goes off the ropes but Kris avoids her dropkick and applies a modified Japanese Rolling Clutch for the three count! Kris Wolf wins and Oedo Tai is up 1-0 in the series. Oedo Tai beats down AZM after the match, until Momo Watanabe returns and clears the ring! Queen’s Quest fifth member has finally healed up and will be returning to action soon. I can’t say that AZM’s style is really one I like, as she still basically wrestles in a similar style as she has for the last few years. Which is lots of flash pins and simple offense. And I get she is 15 but they have put her higher on the card so I expect more from someone in this match than I would from Hanan or Ruaka in the opener, I still am not sure she was ready for the elevation. I also don’t love any faction openly cheating in the middle of the ring, referees are pretty lax in Japan on what happens on the floor but having a beat down in the ring is pushing it a bit. So while I love Kris, and she looked good here, not really a match I’d recommend as it is basically every AZM match with not a lot interesting going on. This match is part of the three match Queen’s Quest vs. Oedo Tai series. Io Shirai is the leader of Queen’s Quest and arguably one of the top wrestlers in the world today, while Hana Kimura is in her second year of wrestling but has a huge fan following due to her unique style. Oedo Tai will have to cheat even more than usual if Hana is going to pull this one off, as Io is notoriously difficult to defeat in a normal one vs. one situation. Hana asks Io for a handshake to start but obviously doesn’t mean it so they pull each other’s hair instead, armdrags by Hana but Io hits a flapjack and puts Hana in an armtrap crossface. Hana gets a foot on the ropes for the break, Io goes for the Tiger Feint Kick but Hana blocks it. Both wrestlers end up on the apron but on opposite sides of the ring post, Hana goes for a suplex to the floor but Io doesn’t budge. Hana rams her into the post instead, she goes for another suplex but Io pushes her back into the ring. Hana returns to the ring also and dropkicks Io, stomps by Hana and she elbows Io against the ropes. Irish whip by Hana but Io hits a backflip dropkick, Hana falls out of the ring and Io goes to the top turnbuckle, but Tam throws a board at her before she can jump off. Io falls to the apron, Hana goes to the other side and superplexes Io over the top rope down onto the floor (and onto a blob of wrestlers). Back in the ring, Hana gets on the second turnbuckle and she hits a missile dropkick. She goes back up top and hits another missile dropkick, cover by Hana but Io kicks out at two. Stomps by Hana and she hits a big boot, she picks up Io but Io gets away and hits a series of palm strikes. German suplex hold by Io, but it gets a two count. Tiger Feint Kick by Io, swandive missile dropkick by Io and she hits the running double knee in the corner. Io picks up Hana and hits the double underhook facebuster, she goes up top but Hana catches her from behind and joins her. Superplex by Hana, but Io kicks out of the cover. Hana goes off the ropes but Io snaps off a hurricanrana, palm strike by Io and she hits a tombstone piledriver. Moonsault by Io, and she picks up the three count! The Queen’s Quest vs. Oedo Tai Series is tied 1-1. This match is part of the three match Queen’s Quest vs. Oedo Tai series. HZK returned to wrestling towards the end of last year and immediately joined up with Io Shirai, which was the beginning of the formation of Queen’s Quest. Kagetsu is the leader of Oedo Tai and can win the series for her faction by defeating HZK in their first ever singles match. HZK throws her sucker at Kagetsu before the match, Kagetsu goes to give it back to her but HZK greets her with a slap. HZK goes for a full nelson bomb but Kagetsu blocks it, HZK flings Kagetsu to the mat before stepping on her throat. Back up, Kagetsu pushes HZK against the ropes and chokes her, but Kagetsu gains control of the match and stomps at HZK. HZK tries to fight back with elbows but Kagetsu returns fire, jumping elbow by Kagetsu in the corner and she hits a vertical suplex for a two count cover. Kagetsu quickly applies a cross-arm submission, she then puts HZK in the ropes and with the other members of Oedo Tai they attack/tickle HZK. Kagetsu dumps water on HZK’s head and goes off the ropes, but HZK hits a springboard dropkick. HZK sends Kagetsu out of the ring, she then gets on the second turnbuckle and dives out onto her. Back in the ring, HZK picks up Kagetsu but Kagetsu blocks the slam. Knee to the stomach by HZK and she hits a running elbow in the corner, she then straddles Kagetsu over the second ropes and drops her with a Codebreaker. Bombs Away to the back by HZK and she puts Kagetsu in an armtrap crossface, but with Tam’s help she makes it to the ropes for the break. Kagetsu pushes HZK back and delivers a strike combination, Ebisu Drop by Kagetsu but HZK kicks out of the cover. Both wrestlers are slow to get up and they trade elbows, HZK goes off the ropes but Kagetsu kicks her in the head and nails a chokeslam. Buzzsaw Kick by Kagetsu, but HZK bridges out of the pin. She goes for another chokeslam but HZK gets out of it and hits a Pump Kick, more Pump Kicks by HZK and she covers Kagetsu for two. Full nelson bomb by HZK, but that gets a two count as well. HZK picks up Kagetsu but Kagetsu gets away and throws HZK into the referee, HZK slams Kagetsu in front of the corner and nails the Bombs Away, but Kagetsu spits water in her face as she is on the way down. Ebisu Drop by Kagetsu, she goes up top and delivers the Oedo Coaster for the three count! Your winner is Kagetsu, and Oedo Tai wins the match series 2-1. We have reached the only title match on this smaller Korakuen Hall event. Takumi Iroha left Stardom in the summer of 2015 in what was a rough year for the promotion, and it wasn’t an easy loss for Stardom as while Takumi was still working her way up the card, her leaving (along with Reo Hazuki and Koguma) left the midcard void of talented young wrestlers. She joined Chigusa Nagayo in Marvelous and since that time her stock has grown dramatically, as she has had success not only in Marvelous but has won big matches in Pro Wrestling WAVE (where she holds the tag team championship) and SEAdLINNNG also. And now she returns to her old stomping ground, facing off against Yoko Bito for the first time in her career. 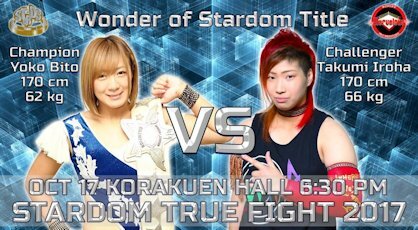 Yoko Bito won the Wonder of Stardom Championship against Mayu Iwatani back in September, and this is her second defense of the title as she looks to keep the belt within the promotion. After a long star down they finally lock-up, Takumi gets Bito in the corner but she gives a mostly clean break. Scoop slam by Takumi but Bito shoulderblocks her to the mat, Bito kicks Takumi into the corner but Takumi avoids her scissors kick and kicks Bito in the leg. Takumi applies a kneelock, but Bito gets back to her feet and delivers a lariat. Knees by Bito and she hits a vertical suplex, Takumi charges her in the corner but Bito ducks and hits a B Driver for a two count. Takumi rolls out of the ring holding her head but Bito goes out after her, hitting an ax handle from the apron. Bito throws Takumi into the chairs at ringside and then into the ring post, Bito charges Takumi but Takumi catches her with a powerslam on the floor. Back in the ring both wrestlers slowly recover and trade elbows, snapmare by Bito and she kicks Takumi in the shoulder. Takumi tries to bail out of the ring but Bito grabs her and puts Takumi across the second rope before kicking her in the back. Takumi delivers a kick combination and hits a butterfly suplex hold, but Bito kicks out at two. Takumi goes up top but Bito joins her, Takumi knocks her back down but Bito kicks her in the head and delivers the superplex. Bito goes back up top and hits a missile dropkick, she goes off the ropes but Takumi catches her with a heel kick. Knees by Bito and she hits a running elbow in the corner, but Takumi hits an elbow of her own before delivering a half hatch suplex. Swinging guillotine by Takumi and she puts Bito in a sleeper, but Bito gets to the ropes for the break. Takumi quickly hits a backdrop suplex and kicks Bito twice in the head, cover by Takumi but Bito barely gets a shoulder up. Another kick by Takumi, she goes up top and delivers the diving body press before going right back up top again to hit the Swanton Bomb, but again Bito kicks out. Takumi stays on the offense and tries to get Bito up for the powerbomb, but Bito blocks it. Release German by Bito and she hits a scissors kick before delivering a second release German Suplex. Buzzsaw Kick by Bito and she hits a heel drop, but her cover only gets a two count. Bito goes for the B Driver, Takumi reverses it and goes for a powerbomb, but Bito reverses that into a hurricanrana. Bito manages to hit the B Driver on the second try, but Takumi kicks out. Both wrestlers connect with high kicks before hitting simultaneous shoulderblocks, and both wrestlers are down on the mat. They recover and trade mid-kicks, dragon screw by Takumi and she puts Bito in a figure four leglock. Takumi drags Bito to the apron and kicks her in the head, Bito kicks her back and they trade blows. They return to the ring and continue going back and forth, Bito wins the battle and she hits another B Driver. Doll B by Bito, she is slow to make it to Takumi for the cover, and Takumi manages to get a shoulder up. Takumi gets Bito in the corner and nails the Running Three, cover by Takumi but Bito barely kicks out. Takumi picks up Bito but Bito hits a high kick, Takumi strikes her back and they both fall to the mat. Before either can budge, the bell rings, as time has expired. The match is a Draw, and Yoko Bito retains the championship! In the grand scheme of things, this was a pretty pedestrian Korakuen Hall event for Stardom as the usual star power wasn’t there. That doesn’t mean the matches were bad, as the Queen’s Quest vs. Oedo Tai series was fun and the main event was really good, but missing so many key wrestlers meant it didn’t feel as noteworthy. Seeing Takumi Iroha in Stardom again is worth tracking down as she has grown a lot in the two years since she left, but no other match will be memorable in the long run. If you are really selective on what Stardom shows you watch, this one can probably be skipped, but overall there was more good than bad here and its decent enough for a casual watch top to bottom.